Mauritius used to be a great supplier of jeans to Europe not long ago. However, over a period of time, the country has lost much of its charm as an exporter even though it enjoys duty free status to EU. This was mainly because of increased labor costs and also the tough environment regulations of the govt. The country seems to have lost the game where the apparel exports are concerned. 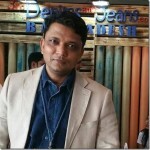 However, there might be a ray of hope for the country with new sustainable technologies coming up in denim washing. It remains to be seen how the country can take them up. The imports of all jeans into EU from Mauritius for the period from 2014 to 2017 saw a fall in trend for the three consecutive period from 2014 to 201 .In the year 2014 the imports saw a fall of about 24% from little more than 3 million pcs in 2013 to close to 3 million pcs in 2014, further in the year 2015 it saw a fall of 5% and in the year 2016 it saw a fall of 18% from little more than 2 million pcs in 2015 to close to 2 million pcs in 2016 , however in the year 2017 it saw a increase of about 4% to close to 2 million pcs which is a positive sign . Mauritius is mainly a men’s jeans exporter with about 70% of all jeans being men’s. However, the trend as seen in All jeans was visible here also and the imports fell for the three consecutive period from 2014 to 2016, in the year 2014 the imports saw a fall of 34% from close to 3 million pcs in 2013 to close to 1.7 million pcs in 2014, and in the year 2015 it saw a fall of less than 2% . 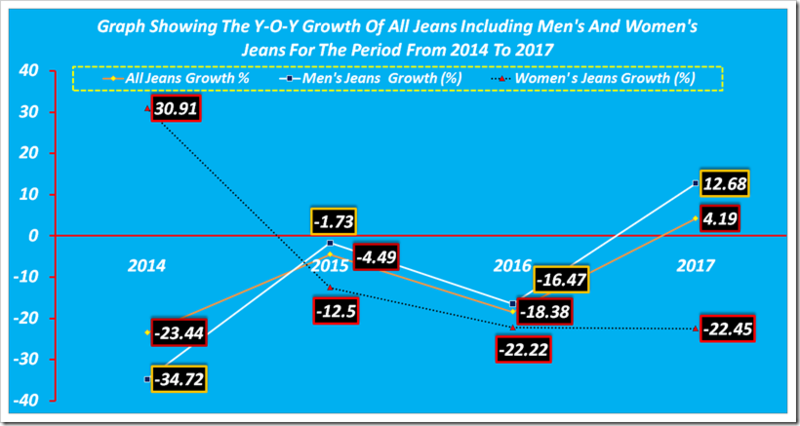 In the year 2016 it saw a fall of 17% , however in the year 2017 the imports in men’s jeans increased by 13% to close to 1.6 million pcs. 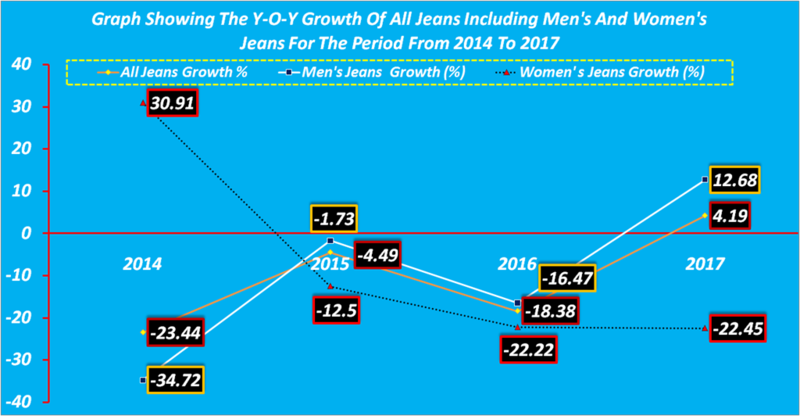 The imports of women’s jeans into EU from Mauritius saw a significant increase only in the year 2014 of about 31%, and for the rest of the period , starting from consecutive period from 2015 to 2017 saw a fall in trend, the imports in the year 2015, 2016 and 2017 saw a fall of about 13% , 22% and 22%. respectively. This is reflective of the fact that the country is not geared up to process high fashion jeans and is losing orders in this regard.